Boating is a major focus at Owasco Yacht Club. Sailboat racing is a weekly event on Sundays and Wednesday evenings. All-lake regattas on the 4th of July and Labor day are annual events. The Portsmouth Handicap System is used for score keeping. Our emphasis is on having fun and honing sailing skills. Owasco Yacht Club is a member of US Sailing and the Central New York Yacht Racing Association. A junior Sailing Program is available for junior members and local students. Kids are taught sailing in a fun, safe environment by a knowledgeable instructor. Owasco Yacht Club owns seven sailboats for the junior program and the membership at large. 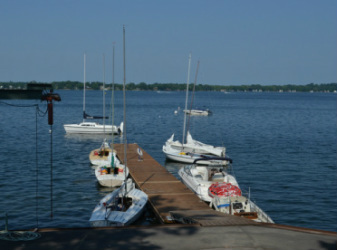 Owasco Yacht Club has ample mooring and beach space for numerous boats ranging from dinghies to thirty footers. Facilities include a launch ramp, lifting crane, trailer parking, and boat docks for day use. The sailing program starts on Sundays in early June and runs through to the Labor Day regatta. All current information can be found on the Racing Program Page. The Summer Trophy Series runs every Sunday June through August based on interest and participation. ​Please check the Racing Page for schedules, classes and details. Racing Results, when available, can be found on the Results Page. Weds Night series is a separate fun series that will be scored separately. This is the place to start out if you just like to "cruise" or need a good excuse to be on the water. Details on the Racing Program Page. © Owasco Yacht Club 2019 All Rights Reserved.